Whether in a cable headend, Earth station or teleport, reliable signal transmission and distribution is the backbone of a facility’s successful operation. From signal reception at the satellite dish, to processing and distribution within a facility, and final distribution, signal quality availability must be properly engineered and managed. Redundancies play a key role in order to guarantee maximum reliability and uptime. Satellite Earth Station antennas, often referred to as satellite “dishes,” are used for receiving satellite signals from television programming networks at cable head ends and other facilities. Their size may vary from 1 to as large as 30 meters in diameter, depending on the frequency, satellite position, and service requirements. The signals are transmitted from space to earth at different frequencies and polarizations between satellite and ground antennas. Television signals are usually sent in the Ku- (10-18 GHz) or C-band (3-6 GHz) or a combination, depending on local and regional environments. A growing number of signals around the world are being broadcast at Ka-band (20/30 GHz). The direction of the electric field of the received electromagnetic wave is called polarization. The Vertical and Horizontal polarization are perpendicular to each other. The separation is performed by an antenna feed, which feeds the signals to a Low Noise Block Converter (LNB). The LNB (Low Noise Block Down Converter) frequency converts the weak signals received from satellites and amplifies them for delivery via cables to indoor reception and decoding equipment typically racked with other electronic networking units. The high-frequency input signals received (or downlinked) from the satellite in space are typically down converted by the LNB to the L-band (950-2150 MHz) or extended L-band (850-2450 MHz) frequency range and transmitted via cable, such as coaxial copper cables. Specially shaped antennas provide the ability to mount more than one LNB to receive several different satellite positions simultaneously. Lightning protection devices directly installed on the antenna, or in the downstream signal path, can be used in order to protect equipment in the downlink chain from over-voltage damage. The next step is the transmission of down converted signals from the LNB to the Integrated Receiver/Decoder (or IRD), which processes and decodes the signals to baseband. This link is sometimes called the Inter-Facility Link or IFL. The electrical transmission over coaxial cable from the LNB often leads to attenuation losses, especially at longer transmission paths. Amplifiers are commonly used at the beginning of the route to compensate for losses. Otherwise, the signal level and Signal-to-Noise Ratio (SNR) can be too low to ensure proper signal quality. For antennas and systems with transmission paths of less than 100 meters from LNB to IRD, transmission over coaxial cable introduces minimal losses and is typically acceptable for cost reasons. For larger cabling distances, or for systems with multiple antennas, where bigger line losses over coax would result, RF-over-Fiber transmission delivers major advantages and should be used. In addition, if a particularly high signal quality is required, coaxial IFL links may not be a prudent option. • Unlike copper coaxial cable, fiber is very resistant to Electro Magnetic Interference (EMI) effects, such as can be caused by power systems, heating, ventilation, TV and radio station signals, radar, etc. • Security: fiber is much more difficult to tap than copper. The conversion of an LNB output signal onto optical fiber usually takes place in dedicated devices that are housed outdoors in the rack shelters at an antenna site close to the antenna. Compact units are typically used, such as RF equipment supplier DEV Systemtechnik’s DEV 7152 outdoor chassis (See Figure 2). Devices mounted directly on the mast of the satellite dish are also in use. These devices can provide redundancy features for the link to the IRD (Receiver) in addition to performing electrical-optical conversion. They can also be used to set important parameters for onward transmission of the downlinked signal. Figure 4: Antenna Redundancy Switch DEV 1993. In order to ensure continuous signal availability, even in the case of failure of a part of the transmission chain, routes are designed redundantly. If a section of the route fails, a backup can take over the signal transmission of the failed part. Implementing one redundancy unit for each transmission part (a so-called 1+1 redundancy) would lead to an increase of costs. As backup equipment is only required in the rare case of a primary path failure, a more effective solution is to implement an N+1 redundancy. With N+1 redundancy, “N” number of primary units can share the same (1) redundancy unit, thanks to intelligent switching devices on both sides of the transmission line. The concept of hedging against dropouts with redundancy is not only applied to transmission lines. Antenna fields can also be protected against failure. A motorized steerable backup antenna can be employed to restore failure of 1 to N number of fixed (non-steerable) antennas in a facility. The backup antenna, controlled from an Antenna Control Unit (ACU), can be pointed to different satellite positions in order to restore one of several fixed position antennas. This antenna failure backup restoral can be accomplished using a Redundancy Switch typically installed in an antenna rack shelter. It is also possible to install the switch behind the optical fiber transmission link. If the redundancy switch detects a malfunction of the signal from one of the fixed antennas, the ACU points the motorized steerable backup (redundancy) antenna to the faulty antenna’s satellite position. Once peaked on the correct satellite, the backup antenna can receive and restore the signal in place of the faulty antenna. The signal outage is thus minimized. For operators that do not have a management system that can perform the switching automatically, or do not wish to perform the integration, there is a special solution from DEV Systemtechnik: the DEV 1993 Antenna Redundancy Switch monitors and switches the signals of connected antennas, and it can completely take over the control of the ACU in the case of a dish failure. As a result, it creates a closed, automated system for achieving antenna redundancy without the need for an external management system. Failures are not only caused by technical defects. Severe weather events can affect entire antenna farms, due to attenuation of satellite signals caused by rain and atmospheric moisture, which more severely attenuates higher satellite frequencies (Ku-, Ka-band). However, since outage-causing weather effects tend to be geographically localized, a concept called Site Diversity can be implemented to maximize uptime and minimize weather effects. With this Site Diversity approach, a redundant downlink antenna facility is built in another location, typically at least 50 to 150 kilometers away. RF-over-Fiber (RFoF) is used to link the two sites. The redundant facility would typically be smaller, possibly unmanned, and may only include the primary satellite dishes, outdoor equipment and shelter. At the “Diversity Site,” the downlinked electrical signals are converted for fiber transmission, multiplexed and sent to the main headend receive equipment via fiber optic links. Since the purchase of fiber optic telecommunications service may be required for the fiber connection, and this can incur a costly recurring fee, methods such as CWDM (Coarse Wavelength Division Multiplexing) and DWDM (Dense Wavelength Division Multiplexing) are typically used to bandwidth-efficiently combine and transport the signals from the antenna Diversity Site to the main site. With CWDM or DWDM, using different wavelengths, up to 16 or 80 different signals can be transmitted over a single optical fiber. At the RF-over-Fiber receive location a demultiplexer divides the multiplex back to individual channels and paths. The switching between the antenna sources can also be managed by a 1+1 redundancy switch. 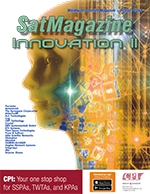 To distribute, demultiplex, transport, and switch RF-over-fiber signals within and between facilities, different approaches are viable, depending on the application and operator preferences. The classic version is a hard-wired distribution: the incoming RF signals are fed to the electrical-optical converters on a splitter. Integrated amplifiers are mostly used here, since splitting reduces signal power. For instance, the signal level drops by about 3-4 dB with a 1:2 splitter. A distribution of 1:128 corresponds to an attenuation of approximately 26 dB. This very significant loss due to splitting must be addressed in addition to any line losses. 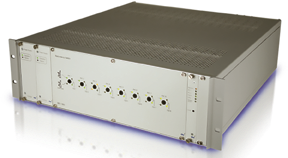 DEV Systemtechnik is a key supplier of equipment for RF signal distribution, switching and amplification functions, offering unique solutions in a single chassis. These products are available in different sizes and with different degrees of integration. Combining both the signal conversion and signal distribution in the same device delivers significant space and power consumption savings compared to conventional solutions. Another, much more flexible option than “hard wiring” a facility is to use a Matrix Switch. This makes it possible to switch an input source to any number of outputs, or vice versa. With an RF Matrix Switch, it is no longer necessary to manually reconfigure the cabling or patch panels in order to change signal paths. Redundancies, optical-electrical conversion, and amplification can all be executed by a Matrix Switch. The device can be controlled remotely via a web browser or by an existing management system. The product portfolio of DEV Systemtechnik ranges from compact RF Matrix Switches with 8 inputs and outputs to a 64x64 matrix, which can be assembled in a cluster, and delivers up to 2048x2048 inputs and outputs. RF signal routing requirements within a facility differ, depending on the application. For programming acquisition, incoming satellite and/or fiber RF signals are transmitted to IRDs (Integrated Receiver Decoders) to decode the video, and/or feed it to the cable or IPTV system multiplex. If an IRD fails or suffers faults, the Matrix Switch can be used to feed a backup IRD, or duplicate and route a problem signal to test equipment for testing and fault isolation. On the outbound transmission side, matrix switches can also be used to route signals from IRD sources for forward distribution, for example to modulators for direct transmission onto an HFC (hybrid fiber/coax) cable network, or to IPTV encoding and multiplexing systems for downstream distribution to set tops. Yannick Zeller is systems engineer at DEV Systemtechnik. He studied physics and mechatronics in Heidelberg and Aschaffenburg and is an expert in the application of RF signal transmission solutions.